After a first news in January confirming the update but no date foreseen for that update, the entry-level smartphone series A 2016, Samsung Galaxy A3 2016, seems to be getting closer and closer to receiving the new software update based on the Android 7.0 Nougat distribution. If you own this smartphone and are waiting impatiently for the arrival of Android Nougat, you will be glad to know that you should not miss much more time for the official distribution. This time, the confirmation of an imminent update is due to the Wi-Fi certification, which shows us a Samsung Galaxy A3 2016 with a new firmware installed. Contrary to popular belief, however, we would be talking about the less recent version, Android 7.0 Nougat, and not Android 7.1.1 Nougat. Although there are actually no major changes between the two versions of the operating system. 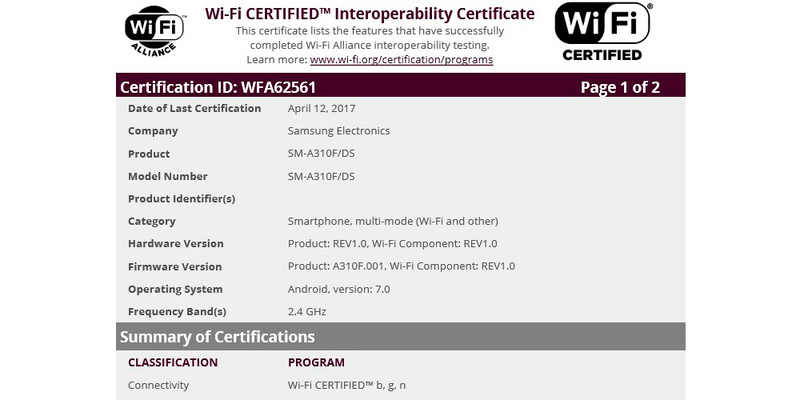 This Wi-Fi certification makes some sense, since the latest version of Nougat is not even present in Samsung's superior range, like the Galaxy S7 and S7 Edge. In concrete terms, the smartphone that has passed the certification of the Wi-Fi Alliance is the model SM-A310 and this implies that the new software must be ready for stable use. According to a supposed calendar that circulates through the network, the update on Samsung Galaxy A3 2016 would occur in the early days of May, testing the new version of Android 7.0 Nougat in some countries. It is also believed that other models from last year (Galaxy A 2016 and Galaxy A5 2016) can receive versions of Nougat before ending 2017, reason why the update would be anticipated before the summer.